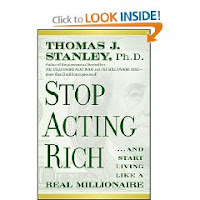 Review of Stop Acting Rich: And Start Living Like A Real Millionaire. I’m a big fan of Tom Stanley’s research and books. I first encountered Stanley at a trust conference many years ago, and I’ve read and recommended his books to dozens of clients and prospects. His insights are helpful and entertaining. His newest book, Stop Acting Rich: And Start Living Like A Real Millionaire, reveals the differences between what we say and what we do. He chronicles the spending patterns of genuinely rich people, and the lifestyles they enjoy. It’s interesting, because there are two groups of people with serious money; the glittering rich (think Donald Trump or Bill Gates) and the millionaires next door. And, as you’d guess, they consume differently. Spending by the glittering rich, well, glitters. These are the few folks with so much money that spending really doesn’t matter. They own multiple cars, multiple timepieces, and they tend to entertain lavishly. We all know who they are and they set a remarkable standard for living. Other rich people are remarkable for differing reasons. As Stanley has recorded previously, they stand out for their modesty and good sense. These millionaires drive Toyotas, wear Seiko watches, and surround themselves with value-oriented merchandise. We know who these neighbors are, too, but we probably don’t realize how financially successful they truly are. They set a different kind of standard. Here’s the paradox of this book. Almost everyone else (and that’s a huge chunk of our society) dwells in yet another culture. This is the culture of false wealth. Where looking rich is more important than being rich. It’s the world of luxury goods sold to high-income buyers. But, sadly, that spending pattern yields no genuine wealth. The simple act of buying those goods, by itself, is financially counterproductive. These are residents of mini-mansion neighborhoods. And owners of luxury automobiles and Rolex watches. They send their children to private schools and belong to expensive country clubs. They buy Brooks Brothers suits and shop at exclusive department stores. They are glittering rich wannabes, and they spend most of their income on a prestige lifestyle. There’s nothing left for saving. The depressing truth is this book won’t change much. Most of us would rather look rich than be rich. We like those luxury goods and that luxury lifestyle, even if we can’t afford them. We can see how sensible living might bring stability and success. We know Tom’s right, but we don’t want to live in sensible neighborhoods or drive sensible cars or wear sensible clothes. That’s the paradox of Stop Acting Rich. We don’t want to. Want to buy it? Purchase it from your local bookstore or from Amazon by clicking here. On Mondays (or sometimes on Tuesdays!) we post a question from a reader and an answer from Dan Danford. If you have a question for Dan, please post it in the comments section. QUESTION: What would you say is the most common financial mistake among most Americans? ANSWER FROM DAN DANFORD: This is really easy for me. Americans make bad decisions about spending. There's an old saying about people "knowing the cost of everything and the value of nothing." We buy stuff with little enduring value and wonder why we're always out of money. We could take examples at every salary level and find really bad ways that people spend money. They buy bad houses, cars, clothes, and electronics. And they lament that they "just can't get ahead." This isn't rocket science. If you have a fixed amount of money - all of us do - and you have to buy things with it, why not buy the best things? This really accomplishes two goals. First, you'll own things that retain value, and second, you can invest the money you save. Another thing, too, actually. You'll be light years ahead of your friends and neighbors who keep right on making bad decisions. We received an e-mail this week from an out-of-state client who was disappointed with our quoted CD rates. He found a better rate at his local bank, and questioned why our rates weren't better. It's a great question - and one that deserved a thoughtful, thorough response. I am printing my response below to help everyone understand CD rates and how they factor into investment decisions. I'm not surprised you found a better rate through a local bank. This issue - extremely low rates - is the toughest we face today. Even locally, there are days where one bank beats another. We aren't big users of bank CDs, but the challenge extends to bonds, bond funds, and money markets. It's another ramification of the recession and government's steps to fix it. Banks that make FDIC-protected CD's available through (brokerage company) are trying to attract new "outside" deposits because their own local markets aren't soaking up the supply. Often, there are regional differences (as you've noted) and there will be times when either group outperforms the other. So, yes, you might do some better occasionally by "moving that money around" to the higher location. These are some related issues we think about, though: Are bank CDs a good place for retirement money? CDs offer safety and stability that's appealing to clients. Yet, they only shine as investments during brief (often tumultuous) moments. The upsides are offset by a lack of liquidity and low returns. What looks like a good rate today may look dismal later as we wait for maturity. How much "extra" can you make by shopping CDs? Is it worth the added effort? Everyone wants to get higher rates, but the actual dollars involved often aren't much. A half-percent difference in a $100,000 CD amounts to just $500 a year. I'm not knocking $500, but value also depends on safety, convenience, and other options. There may be better, easier, ways to earn that $500. And they may not be apparent right now, but one danger of locking in a CD is that it's not readily available if something better comes along. I completely understand your points and I'm glad to help you move some more money down there if you want. My guess is that the rates you earn on the CD portion of your retirement portfolio will have modest impact on your future financial success. But, I want you to be comfortable with the money wherever it is. Whatever part that is up here, Jason and I will watch daily, and we will try to craft some lemonade from today's lemons. We'll not know how we did until we look back on these days several years from now. But, no one will give it as much attention or concern as me! Friday, September 18 the Treasury Department's temporary program to guarantee money market funds ended. The good news is that this was essentially a "non-event" on Wall Street and with investors around the country. You might recall that the temporary government guarantee program was put in place following investor flight from money market funds in the wake of the Reserve Primary Fund's "breaking of the buck," meaning that the fund's net asset value fell below $1 per share. The collapse of Lehman Brothers was the primary impetus for the failure of this fund, and investors were understandably fearful that this event might spread to other money market funds. It didn't. On Mondays, we answer questions on the blog from readers. 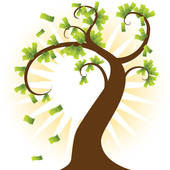 If you have a financial question, post it in the comments section or e-mail robynsekula@sbcglobal.net. QUESTION: I would like to use a credit union for my banking needs. Is there any reason not to do so? ANSWER: No real difference in terms of safety or basic services. Where you'll find a difference, if any, is the range of services. Unless you're working with a huge credit union, you're not likely to see the depth and breadth of service that you'll find at Bank of America. However, basic services will look and feel very close, and industry safeguards are very similar. Credit unions enjoy one huge advantage over banks. Taxes. As non-profit entities (originally started to offer financial services to employees of s single company), credit unions don't pay taxes because they don't earn profits. That means they can operate on lower spreads (interest they earn minus interest they pay). Theoretically, at least, that translates into higher interest for depositors and lower rates for borrowers. Those non-profit distinctions have fallen over the years as credit unions have grown to include folks who don't share an employer or industry. And some of the credit union have grown to incredible size, rivaling many local or regional banks. That has increased the services they offer, but, also, the overhead and salaries they must cover. Clearly, there's less and less difference between credit unions and banks. That's probably good for consumers, although many bankers don't like it much. Like all else financial, shop around before making a decision. But if you find a credit union that meets your needs, don't hesitate to use them. There's some great content out there on personal finances, and this is one of the latest from Yahoo!, which does a pretty decent job of covering business. This article reviews the mistakes that people make during/before a recession. Seems obvious in retrospect, doesn't it? But it's not too late to correct your mistakes. You can change. Read on. A friend was recently pondering the merits of socialism. I think he’d like to soften capitalism, and make it friendlier and more compassionate. He’s a sensitive guy, and he likes to help as many folks as possible. But there are some problems with that. First of all, capitalism got us here. Socialism could never create the living standards we all take for granted today. No rewards for creativity or innovation results in neither of those things, and they've been responsible for myriad advances in everything from safety to medicine. Personal recognition and reward for exceptional effort are the very essence of capitalism. I’d suggest that many Americans who aspire to creativity and innovation do so precisely because they've been freed from challenges inherent to earlier socialistic regimes. Compare the relative accomplishments under both systems in the 1940s, ’50s, and ’60s - especially the standards of living among middle classes. There's no real comparison where it really counts: how the typical citizens live their daily lives. I don't tout capitalism because it's morally superior, but because it's done more for more folks than any other contemporary system. Some argue that socialism strips away the temptation for corruption, but that’s not true. Corruption exists under every social system. I’ve grown weary of the “corporate greed” theme. I suppose it is inevitable, given the situation with bank bailouts and Wall Street shenanigans. Most of us work for decent companies, though, which exist to serve customers. They are profit-making organizations, but those profits fuel our entire system. Basic economics provides support to those of us who favor capitalism. At its simplest, there are just two basic types of economic activity: producers and consumers. Producers are farmers and businesses, and some professionals. Everyone else is a consumer. All of us consume things, of course, but many people work in jobs that consume, too. Take public education, for instance. There’s no question that teachers do meaningful work. So do judges, and fireman, and legislators. Still, it’s important to note that they are paid with tax money. The same thing goes for other government workers, social agencies, and charitable groups. The money that flows to them in taxes or other support originates from society’s producers. Those groups, in turn, pay their workers who pay their taxes and consume more goods. But the spigot of money flows directly from farmers, and businesses, and other people and firms who support them. I don’t make excuses. I despise criminal or unethical behavior, but crime is such a wee part of corporate America. Yet, some folks think every business is bad and every MBA is a crook. There are no easy answers. I understand my friend’s points. There's clear need for regulatory and government activity, and unhampered capitalism can be dangerous. There’s a definite role for government and a need for balance. But I also fear unintended consequences. Some of our most regulated activities, including medicine and public education, display ample reasons for concern. Regulation itself can create massive barriers to entry, and monopoly status. Consumer pricing, access, and service suffer because well-intentioned regulations favor incumbent vendors. Incentives for creativity and innovation fall idle. On Mondays, we answer a question in this space from a reader. Today's question comes to us from Twitter, specifically from @CFMcG. (Thanks for the question!). The answer is from Dan Danford of the Family Investment Center. Please send us your questions - we are always happy to answer reader questions. Question: What are some income generating strategies for a sideways market? Covered calls, cash secured equity puts? 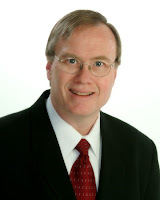 Answer from Dan Danford: Well, looking for income is a very common pastime today. With treasuries, money market funds, and banks paying almost nothing, investors are scratching to find any return at all. But it's a tough environment for that. The tools you mention have a place in the investment world. And there are folks on Wall Street and elsewhere who specialize in derivatives (so-called because the price is derived from an underlying stock or security). Puts and calls are actually dated options to buy or sell a particular security for a specified price. Their value rises or falls with the stock's price, and they finally expire at a specified date. Holders can exercise the option (by buying or selling the security) for profit, or let it expire worthless. For most of us, these aren't a practical way to make much money. First, it takes a lot of volume to offset the costs. Second, most of us are amateurs and the market's Big Money investors are pros. Translation? The other side of each trade you place is likely a professional with far more research and resources than you have. And, last, there's a big element of speculation (gambling) in the decisions you make. Gambling - in my estimation - has no place in family finance. Is this an indictment of all derivatives? No. For many large investors, they offer a type of "insurance" for their portfolio. Much like a farmer who sells his crop months in advance, the portfolio can lock in certain gains or protect against certain losses. And some professionals are willing to speculate on the other side to generate a potential profit. As I said earlier, these are sophisticated tools in the marketplace, and they play an important role. They just aren't very practical for the typical investor. Don't try to create something from nothing. Today's rate environment is bad and that's a disaster for income investing. But, sometimes you have to take what the market give you. Most of the big mistakes I see is when investors - frustrated by dismal returns - accidentally increase their risks. People dismayed by government bonds jump to "hi-yield" corporate bonds to get a bigger coupon. But that junk only pays a higher coupon because it's riskier. In some cases, the risk is more by a huge margin. Believe me, you'll be happier to accept lower rates today than suffering the consequences of reaching for yield. One of the best ways to find extra money isn't necessarily to increase your earnings. Sure, that's good, but you may not have time to work any more than you already do. Before you take a second job, look hard at your spending. This article on Yahoo! Finance outlines how to save at the grocery store, and lists ways that you can save almost $500 per month. Keep this in mind when you're planning the family budget for the month. Why do people blow big money? Should I convert a regular IRA to a Roth? On Mondays, we post a question from a reader and answer from Dan Danford in this space. We welcome your personal finance questions, too! Please post in the comments or e-mail to robynsekula@sbcglobal.net. QUESTION: I’m looking at converting a regular IRA to a Roth. I’m 45, and the IRA has about $36,000 in it. How would I do that? Should I do that? ANSWER: Roth IRAs will get a lot of attention in coming months because Congress changed the rules to make a conversion easier for some folks. Like I say, there will be a lot written as we go forward, and I'll let the experts add voluminous details to this discussion. To convert a Roth requires that the taxes be paid now. So, with a $36,000 IRA, the conversion itself will create a $36,000 taxable event this year. You'll owe federal and state taxes on that amount. Depending on the rest of your family income, taxes could be computed at a fairly stiff rate. Most experts suggest that you pay the tax with other money (your savings account, maybe) so that you can roll the entire $36,000 into the new Roth. Forever after, that money will grow tax-free, and you'll not pay taxes on distributions in retirement, either. That part is pretty appealing, for sure. I can't answer your question without further information. The theory is that taxes today may be lower than they will be in the future, so you'll pay at a lower rate. That may be true, but it's always dicey to predict the future. A lot could happen between now and your eventual retirement. And, if you make the conversion today, it will all happen at today's marginal tax rate. Without a conversion, you could stagger withdrawals to minimize taxes in any particular year. In other words, you might control the tax bite through a thoughtful withdrawal scheme. In fact, those distributions (and taxes) could be staggered over your beneficiary's life expectancy. That's even more to think about. Look, this is not likely to be a life-changing issue with your $36,000 IRA. I'd not be in any hurry to convert until all the experts weigh in. Personally, I rarely rush to pay taxes anyway, so my inclination would be to leave things as they are. But that could change as we learn more in the future. Don't you hate it when people you haven't seen for years suddenly want to take "just an hour or two of your time" to put you on a "road to financial success" and line their own pockets in the process? Recently, on www.dadsdivorce.com, I commented on these type of programs and how to evaluate opportunities. You can watch the video below. 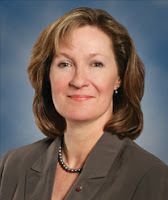 We've long believed in the work of Marie Swift, who has built an excellent reputation as a public relations and marketing professional, particularly in the world of advisors. She does terrific work and has advised us along the way. Marie is a frequent contributor to many publications, and we are delighted that she's happy with our work on Twitter and this blog. Her endorsement means a lot.